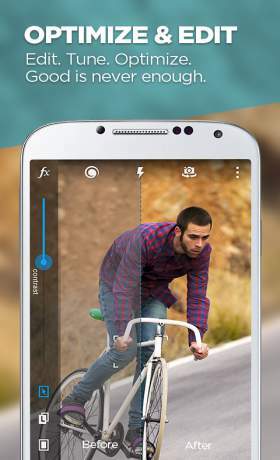 Camera MX is an excellent camera app that offers a lot more than just a camera. Its many features and tools make it an interesting alternative to whatever your default camera app might be. New: The innovative “Shoot The Past” mode allows you to easily capture difficult-to-photograph moments of moving motives (e.g. laughing babies, house pets, lightning). It lets you go back in time to just before the shot. Retroactively select and save what happened before the actual photo. Tons of effects (HDR, Lomo, mirror, kaleidoscope, auto optimization, overlays and textures) and optimization options (brightness, photo + video rotation, contrast, color temperature, aspect ratio) help you create truly unique photos and videos. Cut videos right on your smartphone or tablet. Keep only the best parts and save storage space. 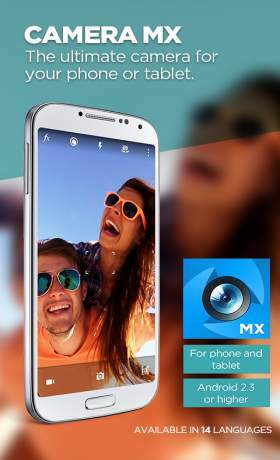 Camera MX also contains an excellent media manager which can be used to keep track of all your photos and videos, as well as move, delete and edit them. Online Album is a platform where you can save, archive, share and view all your images. ✔ Simple user interface – The intuitive user interface in Camera MX makes recording videos and photos quicker and easier. ✔ Superior photo quality – Visibly sharper results thanks to intelligent image processing. ✔ Extensive photo and video editing – Create spectacular photos and videos with countless effects (HDR, Lomo, mirror, kaleidoscope, auto optimization, overlays and textures) and optimization options (brightness, photo + video rotation, contrast, color temperature, aspect ratio). You can also cut and trim photos and videos, as well as change the size and resolution. ✔ Shoot The Past – This innovation feature lets you capture what happened before the actual photo. Capture hard-to-photograph moments (e.g. laughing babies, lightning, animals) and never miss anything again! ✔ Scene modes – Always get the right settings thanks to corresponding scene modes (selfie, night, sunset, snow, landscape, etc). ✔ Clearly arranged media manager – Keep track of all your photos and videos. Use multi-selection to quickly delete, move or copy several files at once. You can also manually sort files. ✔ Tablet compatible – can even be used without a camera! ✔ Online Album – Save, archive, share and view your photos and videos. ✔ Send photos as postcards – You can easily send your favorite shots as postcards to your loved ones. 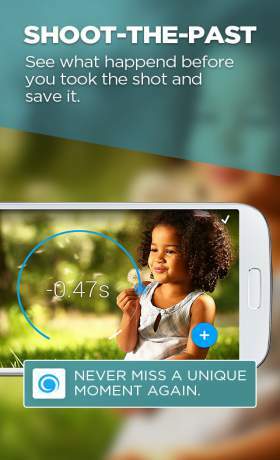 A Better Camera Unlocked Apk 3.52 (Unlock/Paid) for Android Fast Camera – HD Camera Professional 1.96R Apk for android Google Camera v4.2.023.136789878 Apk Snap Camera HDR Apk Full 8.8.0 android MagicPix Pro Camera HD V3.8 Apk for android LINE Camera – Photo editor 14.1.1 Apk for Android Z Camera – Photo Editor, Beauty Selfie, Collage VIP 4.35 Apk for android EyeEm – Camera & Photo Filter 6.0.6 Apk for android PIP Camera-Photo Editor Pro 4.6.7 Apk for android Android Camera & Photo Editor 2.1.1.